Comedic relief is such critical moment when it comes to storytelling. A delicate balance that could dictate the tone a book might take. Even though this issue definitely leans towards more serious since it deals with two factions who favor different ideologies, you need a moment of comedic relief to assure your audience. Having Hector Hammond casually change not only the back round but also their clothes is hilarious. The plot doesn’t stop and it’s a nice moment before Venditti decides to twist the knife with Tomar Tu. 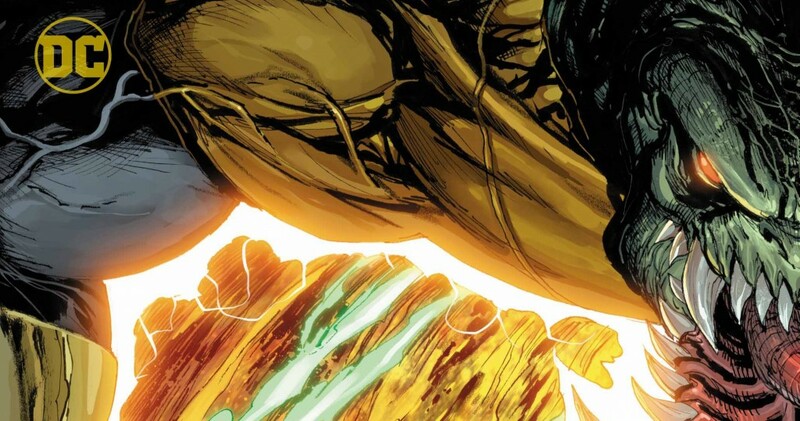 Some readers might dismiss this issue as a pure fight oriented comic, and while they are not completely wrong in their assment they are overlooking the finer details. Namely the biggest detail being the tragedy of Tomar Tu. We’ve seen his emotional battles with Hal and the rest of the Earth Green Lanterns, but I felt that Venditti wanted it further emphasize his downfall with a showdown with Kilowog. While it isn’t nearly as over the top, the conflict between Tu and Wog really reminds me of a classic mentor vs twisted mentee battle. 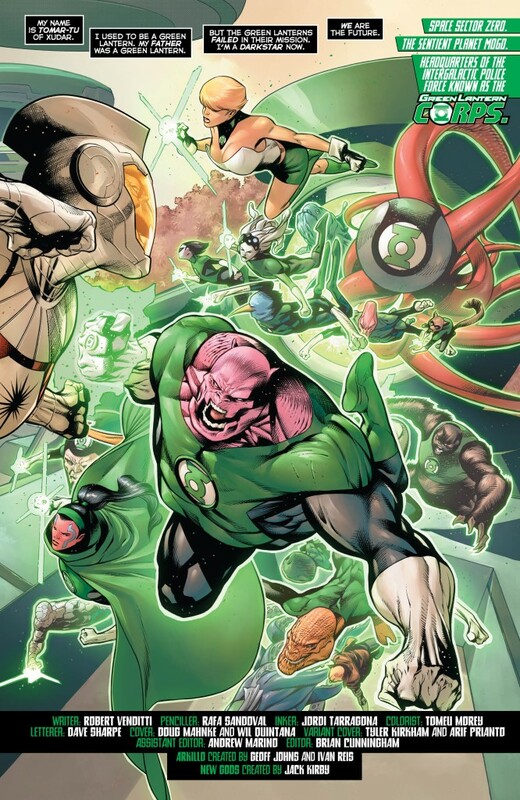 It helps that readers have had time to see Tomar Tu’s point of view and how it’s affected his close friends within the Green Lantern Corps. It’s also refreshing to see that Kilowog isn’t afraid to take the fight to Tomar Tu, by doing so it breaks the tradition of the reluctant mentor tackling his former student. Great storytelling within these sequences. The complete polar opposite of this scene is Hal’s squad leading a direct attack upon the Darkstars. Given that the emotional crux of Tomar Tu is on a completely different battlefield, it seemed to allow Venditti to make this second battlefield be the “fun” one. Most of that hinges on Guy running over hoardes of Darkstars with a monster truck and Kyle using his typical giant mech construct. 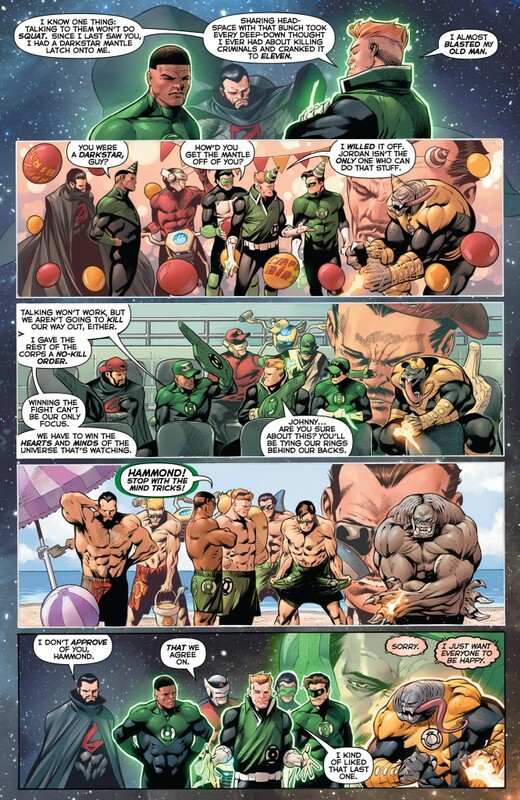 Even though this battle does eventually head to darker waters, I appreciate Venditti’s attempt to bring some light hearted fun before reminding the reader the serious threat that the Darkstars bring to the DCU. Given that issue’s main focus is a giant battle between constructs and idelogies, it only make sense that Rafa Sandoval would pencil this issue. While Sandoval’s doesn’t lack any storytelling skills, it’s clear that his best art shines in these bombastic splash pages. The amount of detail that he’s poured into these pages is near insane, it makes the war between the Corps and the Darkstars feel that much more epic. Despite me shying away from Sandoval’s storytelling, but Kilowog’s facial expressions show how much he’s in pain over losing a friend, most of the time he’s snarling but in certain panels you can see Kilowog’s pain despite his boast of bravado. I’m glad that Sandoval continues to pump amazing work each issue he draws.